The Tri-Mate is a merger of our Son-Mate Scaler Polisher and a general purpose Electrosurgery unit in one control box, giving you the ability to scale, polish and section teeth, along with cutting and cauterizing using three independent handpieces. The unit is supplied with all the accessories equivilant to the Son-Mate along with four different general electrodes for electrosurgery. 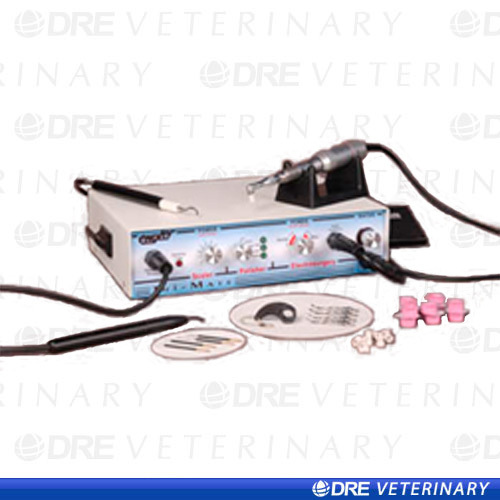 The Electro-Surgery section comes complete with 4 general purpose electrodes. These electrodes push-fit into the end of the handpiece. Net Weight:10 Lbs /4.5 Kg. Shipping Weight: 12 Lbs /5.5 Kg.